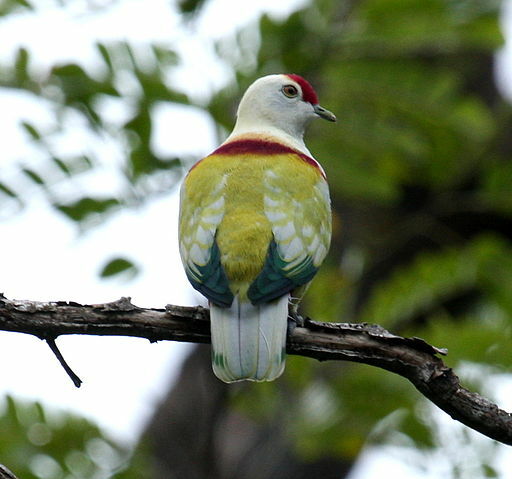 The Many-colored Fruit Dove (Ptilinopus perousii), known as “Manuma” in the Samoan Islands, is a striking and compact dimorphic dove from Samoa, American Samoa, Fiji, and Tonga. While they are not yet listed as threatened by the IUCN, there are reasons for concern for this species. The Manuma faces decreasing population numbers, a restricted range, and shows a highly specific natural foraging ecology that is tied to only two species of ficus indigenous to Pacific islands. Biologists working in American Samoa sought out the help of Pacific Bird Conservation to collect individuals of the species and begin a captive breeding program within Association of Zoos and Aquariums institutions to safeguard against extinction. This would be the first time this species has been kept in an AZA facility. The Toledo Zoo committed to bringing this species into their collection which included developing acclimation and husbandry protocols and creating a behind-the-scenes breeding area for the Manuma. In 2015 the American Samoa Department of Marine and Wildlife Resources, PBC, and the Toledo Zoo began planning a collection trip to the islands. Preparation included permitting, holding, and logistics for the transport of Many-colored Fruit Dove (MCFD) back to the US. In September 2016, 4 pairs of birds were mist-netted on the island of Tutuila and transported back to the Toledo Zoo with a stop in Hawaii, where Honolulu Zoo staff hand-fed the doves before they continued onto the mainland. These Manuma are now currently housed in pairs at the zoo’s Avian Breeding Center. A follow-up collection trip was carried out in 2017 bringing an additional 3 males and 4 females into the Toledo collection. MCFD are naturally flighty birds, and fruit doves can be difficult to transition from a wild to a captive diet. Toledo Zoo staff under the leadership of bird curator Chuck Cerbini hand-fed all doves for as long as each individual required it and successfully transitioned all founders to captive diets. Four pairs of the founders have since produced more than 15 offspring at the Toledo Zoo’s Avian Breeding Center, a great success for a first-time effort by an AZA facility, especially for a fruit dove species. ​At the Toledo Zoo, the MCFD will continue to be a species of high priority, receiving focused management and resources in the coming years. The zoo is constructing a greenhouse facility that will be capable of housing up to 8 breeding pairs of Manuma in flights. Toledo also continues to collect data opportunistically on the development of young birds hatched at the Avian Science Center. Photos are taken of the head in profile, the back, underparts, tail, and open wing of individuals. Collecting these photos may eventually contribute towards developing sexing and aging techniques of wild Manuma. The Center at Toledo Zoo also offers a critical opportunity to learn more about the natural behaviors of this beautiful bird, such as nesting substrate and dietary preferences as well as the courtship rituals between bonded pairs. One MCFD pair is planned for transport to another AZA facility by 2019 in order to build upon the breeding program initiated at the Toledo Zoo. PBC will help support the effort to establish multiple breeding colonies within AZA facilities by augmenting populations with new wild collections in the future if needed.